Yesterday, A&M’s men’s basketball team accepted an invite to the CBI tournament. 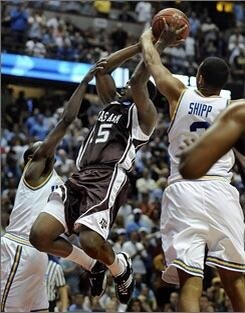 Some think that this is a new low for A&M basketball but we are in good company in the SEC. Only 3 teams made it to the NCAA tournament with Kentucky, Tennessee, and #1 overall Florida. Of the 11 SEC teams that didn’t punch their ticket to the big dance, 10 went to bowl games this past football season. That means no SEC team made both the NCAA tournament and also a bowl game, but 13 of 14 made one or the other. The lone failure to miss both…. Arkansas. With all the excitement of A&M’s CBI bid, we here at Maroon Report have taken to twitter to comprise all #ThingsBetterThanTheCBI. Option to the short side of the field. #ThingsBetterThanTheCBI. And finally, for those who are still bitter…. Follow us on twitter @MaroonReport for the latest updates and more Aggie football news.